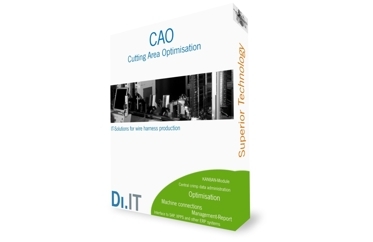 The software solution 4Wire CAO (Cutting and Assembly Optimization) is the leading manufacturing execution system for the cutting area and assembly to optimize your wire harness production. It is the only system, that is distributed worldwide and in all languages. The system has interfaces to machines from Schleuniger, Artos, Komax, ShinMaywa, Schäfer, Yazaki and others, that are continuously updated in close co-operation with the machine manufacturers. That is why 4Wire CAO has the latest and the largest scope of functions that can be regarded as a de facto standard. The software solution 4Wire CAO is flexible, scalable and efficient and already successfully installed by many well-known companies. Due to its modularity, 4Wire CAO is also beneficial for small and medium-size companies. 4Wire CAO controls any cutting area between 2 to 200 machines and meets the highest requirements. Its extension functions adapt flexible to the needs of companies. The automatic distribution and sequencing of cutting orders by optimization reduces the overall setup costs to the absolute minimum, bringing about a higher machine utilization and affording a much more responsive and flexible control of the cutting area. Quality increases significantly, which is both due to the consolidation of production data in 4Wire CAO and the integration of quality measurements directly in the process control. The 4Wire CAO implements an advanced planning and scheduling algorithm for the automatic and optimized distribution of cutting orders and provides for demand-driven Kanban production. Pre-Assembly Optimization is an extension module for the control of the pre-assembly area with 4Wire CAO. It introduces the 4Wire CAO process also in the manual work area of pre assembly and with it transparency, uniform quality processes and continuous data collection. 4Wire CAO captures machine and production data electronically and in real-time. Production and machine states, used materials, produced quantities, tool related usage, quality data, etc. are captured, logged, collated and integrated in various ways to create instant transparency. The electronic capturing of productive and non-productive times at the source is the prerequisite for the calculation of meaningful OEE figures and other key performance indicators (KPI). The uniformly applied data collection method and the standardized calculation of KPI make machines and production sites comparable and open for analysis, so that performance can be continuously improved and optimized. We provide you with individual advice!